The Year Two Annual for Injustice: Gods Among Us differs from the Year One annual in three important respects. First, this annual tells two separate stories compared to last year's single story annual. Next, the tone of these stories is decidedly more serious than last year's annual, which saw Lobo hunting Harley Quinn. Finally - instead of being solely the work of Tom Taylor - the scripts for this issue were written by Marguerite Bennett, who co-plotted the stories with Taylor. 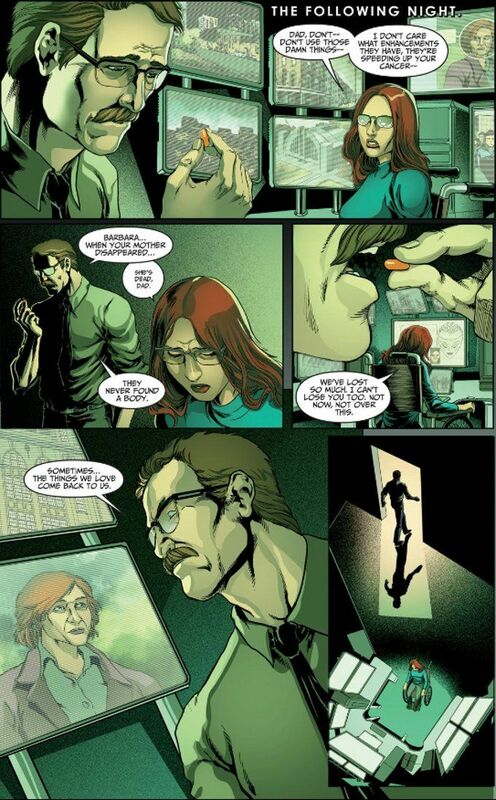 The first story focuses upon Jim and Barbara Gordon and their efforts to find peace in their relationship as Jim's inevitable death from lung cancer grows closer and their investigation of the seeming reappearance of Jim's wife/Barbara's mom, who has been missing for years. Bennet's script perfectly captures both characters and plays out the mystery quite well. Sadly, the visual tone is all over the place due to this story having been rendered by four different artists with decidedly different styles. The second story fares better in this regard, having been drawn entirely by Injustice regular Jheremy Raapack. It too focuses on a troubled relationship - that of Hal Jordan and his former mentor Sinestro as they seek out a Qwardian artifact. The story here is engaging but Bennett's take on Sinestro - which is reminiscent of Geoff Johns' anti-heroic take on the character - doesn't quite gel with the more openly villainous Sinestro that we've seen in Injustice so far. This is a minor point, however, and it is to Bennett's credit that the reader still won't be sure how sincere Sinestro is about regretting how things ended between him and Hal by the story's conclusion. Despite not being essential to the overall story, fans of the Injustice will still want to pick this one up. Fans of Marguerite Bennet's writing on other recent titles will also enjoy this one and shouldn't have any trouble with these stories despite them being set in the complex mythology of the Injustice universe. The stories more than make up for the somewhat scattered artwork.